In its native Japan, it is known as "Sasa-Yuri" or the Bamboo Lily. Difficult to cultivate, it is highly susceptible to virus infection as well as Fusarium and is therefore short lived outside its native habitat. 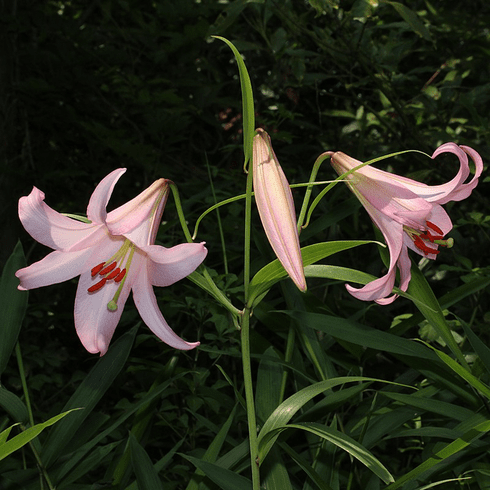 The bell-shaped flowers perch atop 2 to 3 foot stems and are light pink to white in color. Most notable cross by Jan DeGraaff with Lilium japonicum at Oregon Bulb Farm produced 'Pink Glory', a strain of pinks that bears a strong resemblance to Lilium japonicum shown in inset photo #1 courtesy of Ed McRae. Title photo L. Japonicum taken in the Tumihari Mountains, Toyohashi, Aichi Perfection, Japan. Courtesy Wikimedia Commons and credited to Alpsdake. Photo insert #2 is of a bed of L. japonicum as grown by Edgar Kline in the late 1940's. This historic photo of early lily cultivation was provided by Bill and Mary Hoffman. Photo insert #3 shows photo of L. japanicum from the Bill & Mary Hoffman collection.